Sky does! 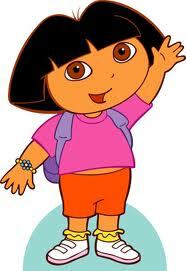 She thinks that she is Dora, or should I say, that Dora is actually Sky. We don't have a TV feed to the house so if we watch anything it's a DVD and we put a half hour show in every morning for Sky so that we can do her hair. For the first six months of this, we only had Dora the Explorer for her to watch but since then we've added VeggieTales, Thomas the train, Clifford, Backyardigans, and Kai lan. Sky calls them all "Aya", which is how she says her name. To get her out of her Dora rut, and because David and I could sing the theme song in our sleep by now, we've been putting in her other DVDs more often lately and Sky has taken that as a sign that she needs to be more specific in her requests. Yesterday morning as we were walking down stairs she asked for Boots, Dora's little mokey friend. "Boots and Aya, Mama?" were her exact words. Okay, smart girl, we'll watch "Boots and Aya".